Olive Garden recipes are developed at their Culinary Institute of Tuscany. Olive Garden is an Italian restaurant chain with more than 750 restaurants across the globe. While the restaurants are known for offering Italian fare, they are also known for their endless soup, salad and breadsticks. The salad comes with a creamy dressing that balances out the crisp vegetables. They don't sell their salad dressing, but you can make your own with just a few ingredients and a blender. In a blender, combine 1/2 cup mayonnaise, 1/3 cup white vinegar, 1 tsp. vegetable oil, 2 tbsp. corn syrup, 2 tbsp. Parmesan cheese, 2 tbsp. Romano cheese, 1 minced garlic clove, 1/2 tsp. Italian seasoning, 1/2 tsp. parsley flakes and 2 tbsp. lemon juice. Blend on low speed until well mixed, then serve. The dressing may be stored in the refrigerator for about a week. The recipe can be adjusted to remove some of the fat. Each of the 8 tbsp. of mayonnaise in the recipe contain 4.9 g of fat yielding nearly 45 calories. Replace the regular mayonnaise with fat-free or reduced-fat versions to reduce those calories without sacrificing the flavor. 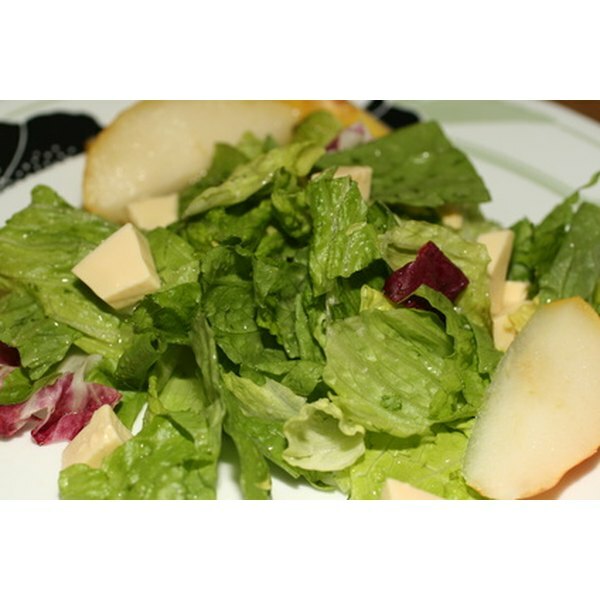 Use low-fat Parmesan and Romano cheese to further reduce the caloric content. The thick, creamy texture of the Olive Garden salad dressing makes it ideal as a marinade for meat. Cover beef, chicken, fish or game meats such as venison in the dressing and chill for 12 to 24 hours before cooking. The salt and fat in the dressing will help tenderize the meat and enhance the flavor. 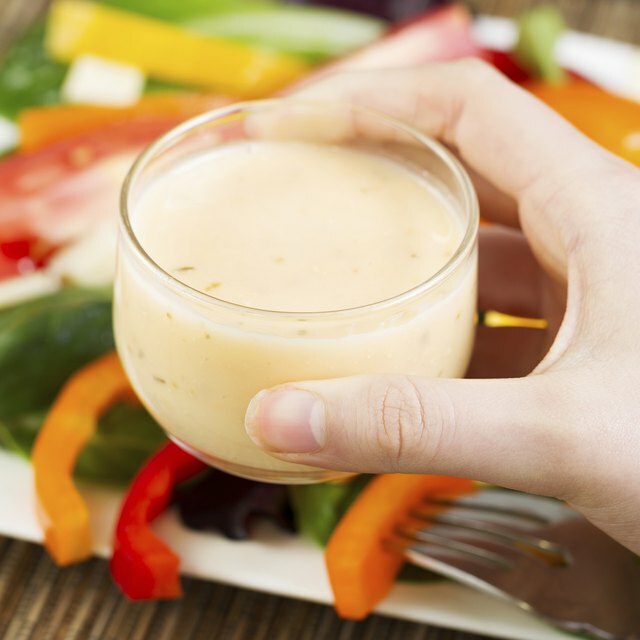 You may also use the dressing as a dip for raw vegetables. Create a platter with carrots, celery, peppers, radishes and broccoli with the Olive Garden salad dressing serving as a dip in the center. If the salad dressing proves to be a bit too tart for your taste, simply add a tsp. of sugar to the mix before blending. Add sugar until the dressing is well-balanced for your palate. If you are concerned about calories, use a calorie-free sugar substitute. Olive Garden; Who We Are? Can You Fry Frozen Tilapia?